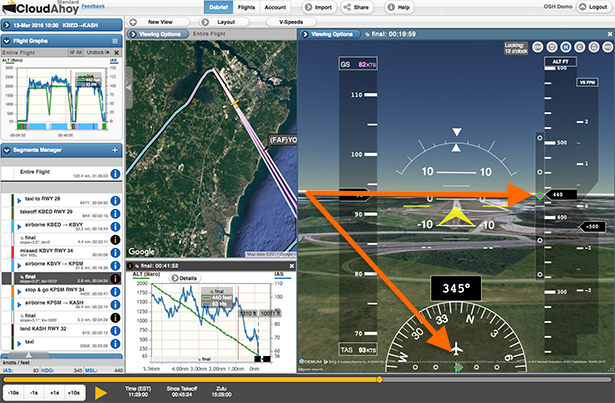 In debriefing flights, significant attention must be given to runways: the points of rotation and touchdown, the altitude and airspeed during the approach – all are critical to flight safety. We now display the runway as a thick horizontal line in takeoff operations, as well as in landings, touch & go, stop & go, and missed approaches. We added an info button to graphs. It provides information such as exact touchdown point, runway remaining, and more. Entire Flight. 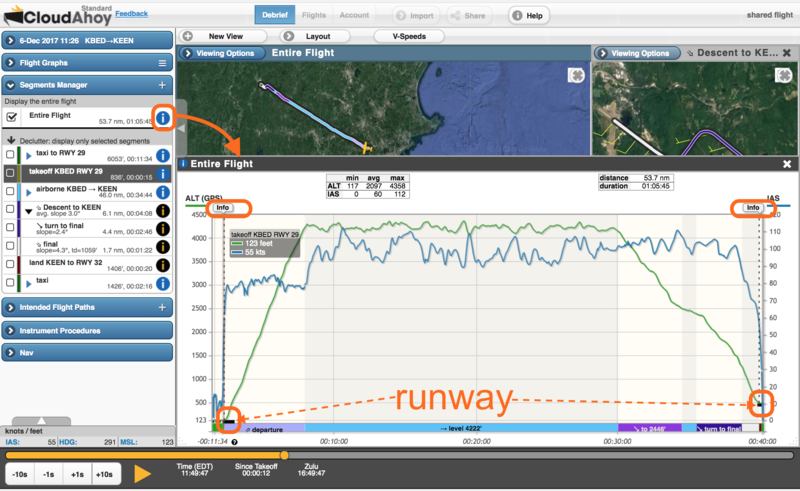 Notice the display of both runways at the lower part on the graph, and the corresponding two buttons at the upper part. We can also see that KEEN is at a higher altitude than KBED. The following example is of a night currency flight. We clicked the Segment Information icon of the Pattern Work segment. It shows the same runway multiple times. The green graph shows the altitude. Note how the blue graph (IAS) drops to 0 at each stop & go. With one click or tap on one of the buttons, you get precise information about the runway operation of the selected Stop & Go. Another way to display the data is by decluttering. The ALT graph on the right shows three consecutive segments: Final, Stop & Go, and Upwind. It is easy to see where on the runway were the touchdown and rotation points. The missed approach is shown with the “before” and “after” segments (dimmed.). The runway is displayed on the lower-right. This is a graph of a precision instrument approach. 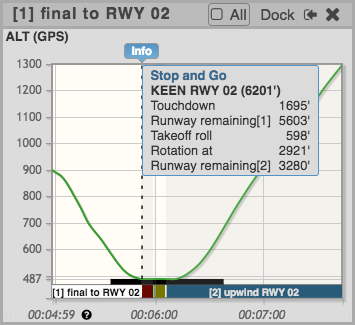 Note the ALT trajectory (green graph) of the Final – if continued, it would intersect the runway at the 1000′ mark. We now display every Segment Information view in context, with dimmed “before” and “after” as in the image above, of the missed approach. The “land” segment (created by CloudAhoy’s auto segmentation) is short in time but crucially important for evaluating the quality of the landing, especially in cases of incident investigation. In our latest release we improved the Segment Info of the “land” segment (working with a customer who was investigation an incident – thank you!). 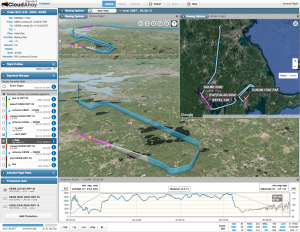 The Segment Info of the “land” segment is especially valuable if the flight was logged with an EFIS, for example imported from Garmin G1000, because the data includes Pitch and Normal Acceleration data (G) – in addition to the IAS which is always available with CloudAhoy. The graphs’ crosshair indicates the exact time of touchdown, when the G was at a minimum. The magnitude of the G graph at touchdown indicates an acceptable landing: neither a “greaser” nor a hard landing. The plane touched down at 5-6° pitch; only the two main wheels touched the ground. After the initial touchdown, the pitch gradually decreased to 0° in about 4 seconds. Note the G graph when the pitch reached 0°: it shows the nose wheel touching the ground, and doing it softly. Zooming on the 2D view, the pilot touched down and remained on the centerline. In hard landings, you will see a sharp spike in the Normal Acceleration (G) graph. In porpoising, you will see fluctuations in the pitch attitude, as well as positive and negative spikes in the Normal Acceleration. The minima indicate touchdowns, and the maxima mark the top of the bounce. If Normal Acceleration and Pitch are not available, we display only the IAS graph. New: when you import a flight from ForeFlight, CloudAhoy will now automatically display the instrument approach flown, if any. 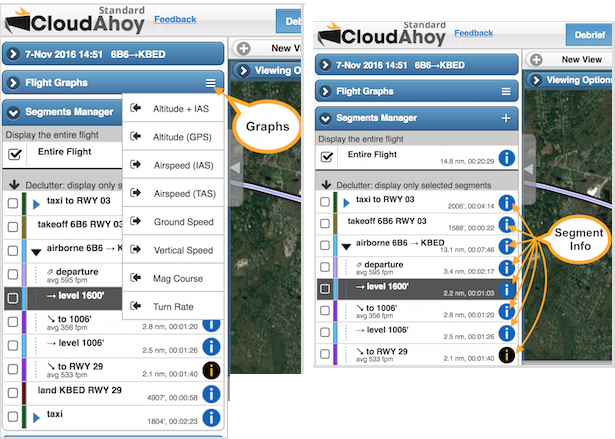 In addition to the instrument approach, CloudAhoy already imported from ForeFlight the entire flight plan. Both are now shown in magenta. Note that you can always manually add additional instrument approaches. 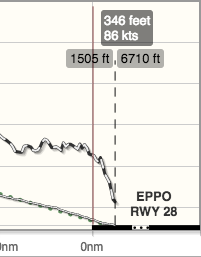 – The pilot was using ForeFlight and entered the IFR flight plan KPWM > KASH. – ATC assigned RNAV (GPS) RWY 32 at KASH, with vectors to final. The pilot added the procedure. – the pilot imported the flight to CloudAhoy. 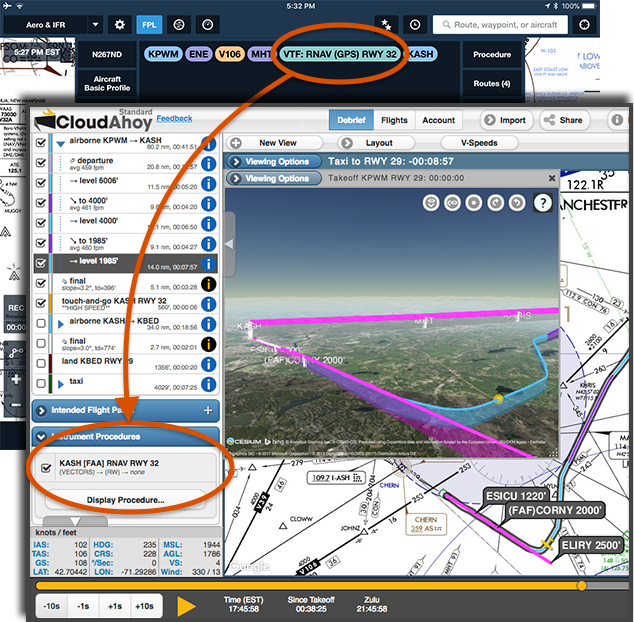 – When debriefing the flight for the first time, the RNAV approach is automatically shown in CloudAhoy as well as the entire flight plan, both are shown in magenta. If you import your flights from Garmin G1000, your can now view the horizontal and vertical CDIs on CloudAhoy’s glass cockpit gauges. It is useful for debriefing the accuracy of your navigation, and specifically your flying of instrument approaches. 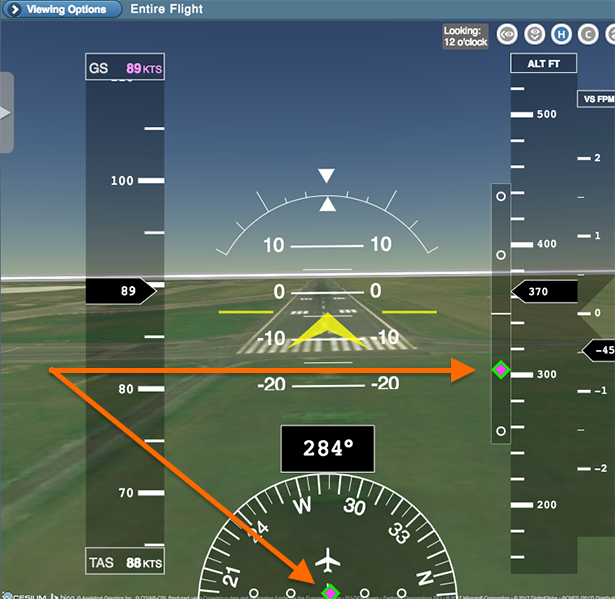 The screenshot below shows the short final of an ILS approach. The horizontal CDI is centered (i.e., the aircraft is on the runway’s extended center line), and the vertical CDI shows the aircraft above the glide slope. Note that if you fly a non-precision approach, then the vertical CDI will not be displayed. Also, the horizontal and vertical CDIs are not displayed when there is more than full-scale deflection. 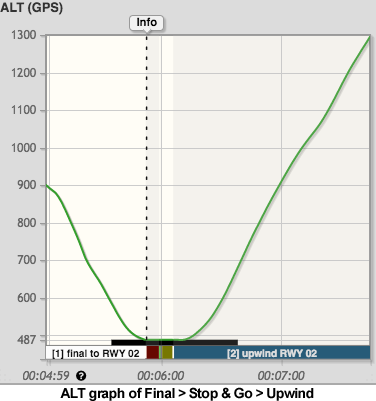 Flight graphs have always been an important tool for CloudAhoy debriefing. 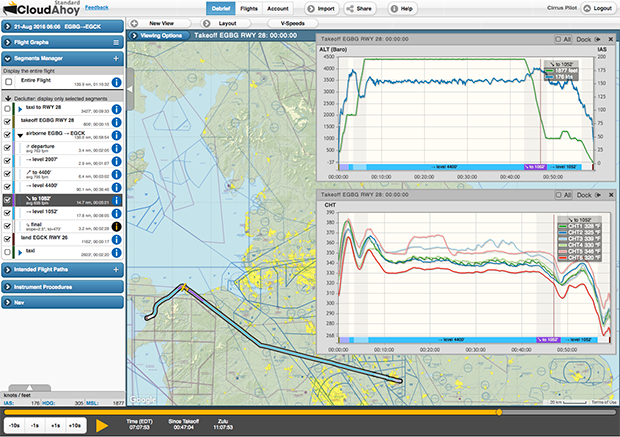 CloudAhoy can display graphs of selected parameters, and you can display graphs for the entire flight or only for selected segments. For example, you can display the altitude and airspeed of one decluttered traffic pattern out of many. 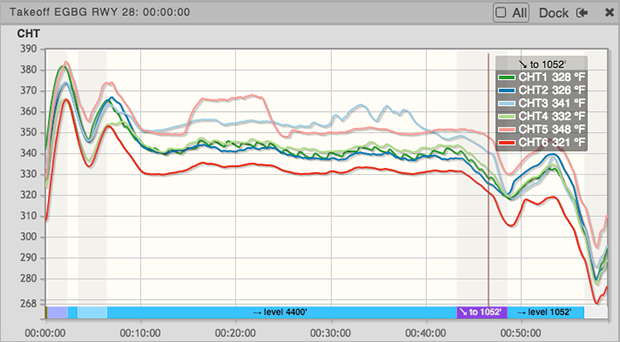 We added multi-value temperature graphs – very useful for engine monitoring. Reminder: graphs are displayed by clicking or tapping the menu icon on “Flight Graphs”, or on a Segment Info icon . When you display a graph from Flight Graphs, you can undock it , move it and resize. You can display a graph for the entire flight, or only for selected segments. More information here. Consider the cross-country flight in the debrief window below. When debriefing, probably the two most useful graphs are the altitude and airspeed. You could display them separately, in two graph windows, or select a combined “ALT+IAS” graph. We selected “ALT+IAS”. In this specific case, the aircraft (SR22T) was new, and we wanted to check the cylinder head temperatures. CloudAhoy now support multi-value graphs of CHT and EGT, and we selected “CHT 1..6”. CHT information is available when importing the flight from an EFIS such as, in this case, Garmin Perspective. Below we will explore the new look of these graphs. All CloudAhoy graphs have the same structure. Notice the segment names at the bottom, along the X axis. The flight segments are displayed on the X axis of the graphs. You can see at a glance that the pilot climbed to 4400′, flew , then descended , etc. The segments are color coded, using the same colors of the corresponding segments in the flight track. If space allows, we display the segment’s name. In the example above, only three segments were wide enough to display their names. We use shades to separate segments, making it easier to correlate graph values to segments. The crosshair shows the current time. You can drag it to move the time. We display the current graph values in a box adjacent to the crosshair. In this case two graphs are shown: the green is the altitude and the blue is the indicated airspeed. Note that we display the current segment’s name above the values. It is useful in cases when the segment’s time is too short for displaying its name on the segment list below. 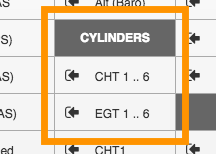 If you import data from an EFIS such as Garmin Perspective or Garmin 1000, you can now display individual cylinder’s CHT and EGT graphs, or combined CHT / EGT of all cylinders. 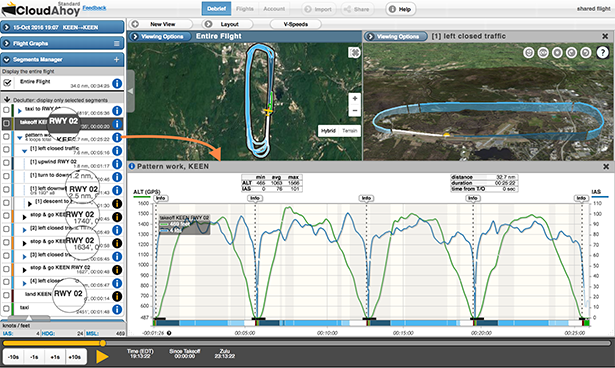 The screenshot on the right shows the new graph menu items, displayed by clicking or tapping the menu icon on “Flight Graphs”. Below is the CHT 1..6 graph from the picture above. 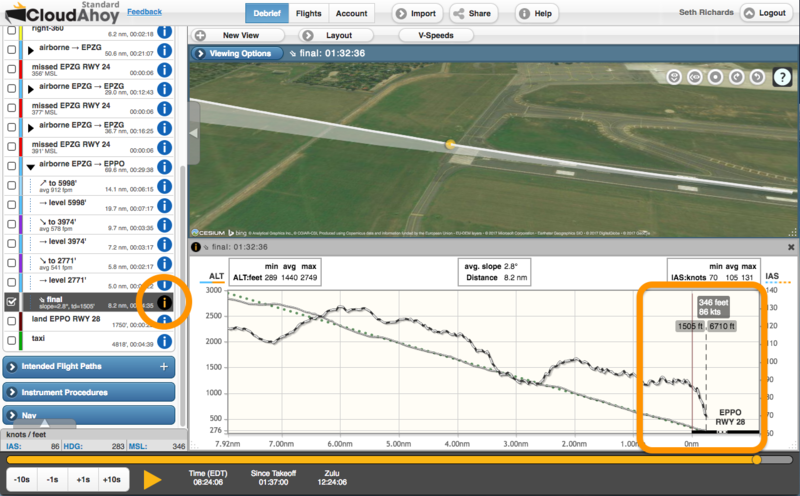 It is now easy to correlate temperature changes to the segments of the flight, in this case climb, level and descent. The CHT and EGT graphs are useful for spotting an abnormal temperature of an individual cylinder, and for debriefing the effects of rapid descents on the engine’s temperatures. How precise are your landings? We released an update to the Segment Info of approach segments. The runway is depicted as a thick black line. The pilot landed on EPPO RWY 28. The touchdown was at 1506’. Till that point the runway is displayed to-scale. 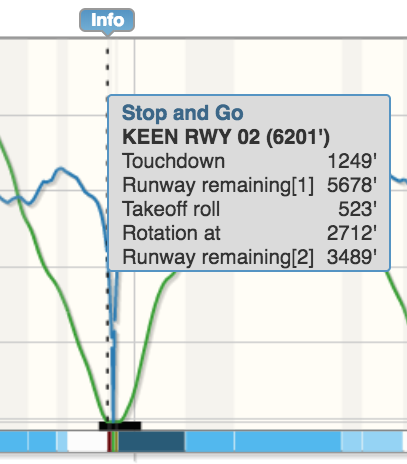 The runway remaining was 6710’. Over the threshold the aircraft (SR22T) was at MSL=346′ and airspeed of 86 KIAS. The short approach was stabilized: on the glidepath, with stable airspeed. To display the Segment Info of the Final we clicked the icon in the segment list. Note the runway depiction in thick line on the lower-right. Click the picture below for details. To check the airspeed and altitude over the threshold, we dragged the time crosshair to the runway threshold. The x-axis along shows the distance from the runway threshold, or in the case of a missed approach the point at which the missed approach started. The touchdown point is labeled with the distance from the threshold to touchdown, as well as the length of runway remaining after the touchdown. The airport and runway number are shown just above the runway. The accuracy of determining the location of the touchdown point depends on the data quality. 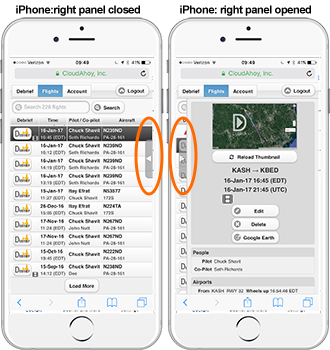 An external GPS with good sky visibility will yield better accuracy than logging with your phone or tablet’s internal GPS. 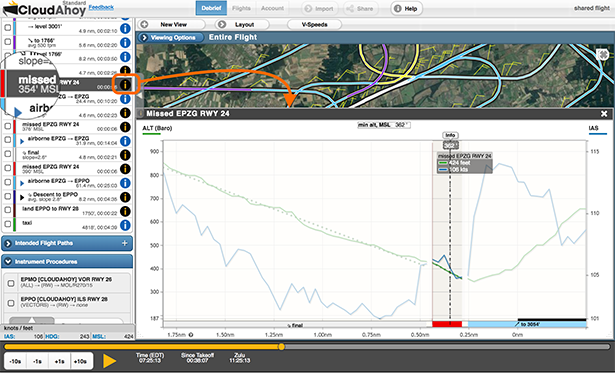 For best accuracy, import the flight data from your EFIS. See this. We released a revised version of the Flights tab, with two important improvements. The Flights tab consists of two parts: the flight list (left) and the selected flight’s details (right). A new handle, on the vertical border between the two parts, allows you to close or open the selected flight’s details. Click or tap the handle to toggle open/close. This adjustable layout is especially handy on narrow displays such as the iPad when you want to view the Remarks fields of all the flights in full. Reminder: you can always search for flights with specific text in the Remarks (as well as search other flight parameters) using Search on the upper-left. This functionality is available on the iPad in CloudAhoy app, or in Safari. It is also available on the iPhone in Safari; it is not yet available in the iPhone’s CloudAhoy app. 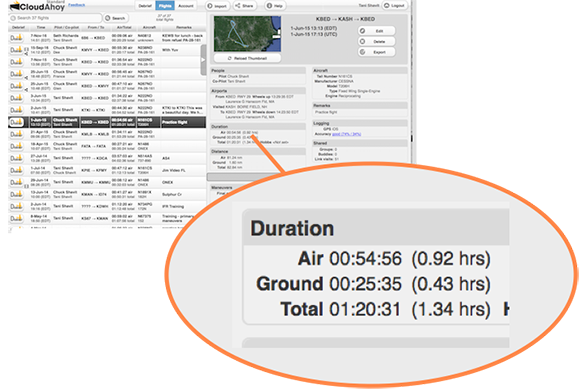 Useful for logbook entries – the Air and Ground times are now displayed in decimal values as well. CloudAhoy supported embedding video for quite some time. Now we’ve added a new tutorial to our video library: how to embed your in-flight video in CloudAhoy’s flight debrief. Enjoy! We released CloudAhoy 5.0 on Valentine’s Day, February 14 2017. What is “CloudAhoy 5.0 Special” ? Each and every user gets a FREE MONTH of CloudAhoy Standard. The “5.0 Special” ends today, March 14 2017. It’s a new generation of our power debrief tool, available to all CloudAhoy users – whether you debrief on the web (Windows, Mac, Android, Linux) or in our iOS apps. 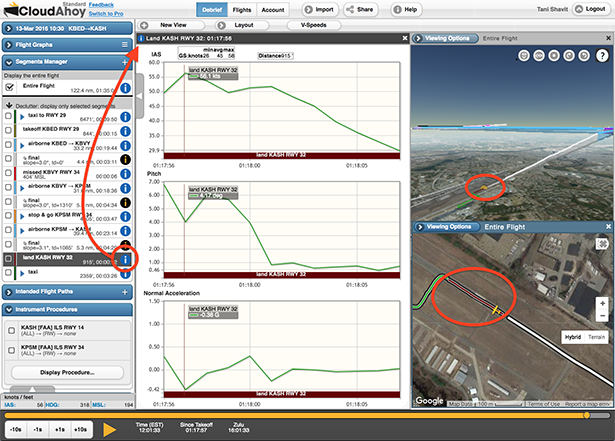 Our enhanced flight analyzer detects, computes and displays approach information. We partnered with SkyVector to provide high quality and up to date charts. Including a powerful flight search, thumbnails, and manuever list per flight. We also released a new version of our iOS app, supporting pilot roles: you can now specify the role of each pilot (e.g., co-pilot, CFI) and whether he or she are the PIC. A new version of our Android app is in the making. Decluttering is useful for focusing on specific segments of a flight. It is especially helpful in training and currency flights, which tend to have multiple maneuvers and complex flight paths. We recently redesigned our declutter tool, integrating it with the tools in the left panel. More information: watch the short video below, and read step by step instructions here. Decluttering is a powerful debriefing technique. Examples: focus only one one traffic pattern out of five, one instrument approach out of three, or isolate and view a steep turn manuever.